At AFS, our mission is to advise and help our clients to secure their future through meaningful interactions, industry expertise and local presence. AFS Insurance & Financial Services, Inc offers personal insurance and business insurance options. As an independent, third-generation insurance agency, we specialize in home insurance, auto insurance, pet insurance, school bus insurance, contractor insurance, daycare insurance and autism school insurance in Waynesboro, PA, Greencastle, PA, Chambersburg, PA, Hagerstown, MD and surrounding areas. Our commitment to building relationships with our clients and within our community, our industry expertise and access to exclusive insurance programs set us apart from other agencies. Trust. All of our agents have committed to lifelong careers at AFS. That means that the same agent that writes your policy today will be there to stand behind it when you have a claim years down the road. Ingenuity. Our agents are professionals, consultants, advisors, not just salespeople. We look at every risk from all angles and pride ourselves on finding creative solutions to guarantee you’re covered in the smartest way possible. Choice. Free cell phone insurance for the whole family? Free firearm coverage? How about coverage for your household appliances that could replace those expensive warranties? We do the hard work to find you the most competitive rates and help you choose the finishing touches that tailor your policy to what’s important to you. Strength. 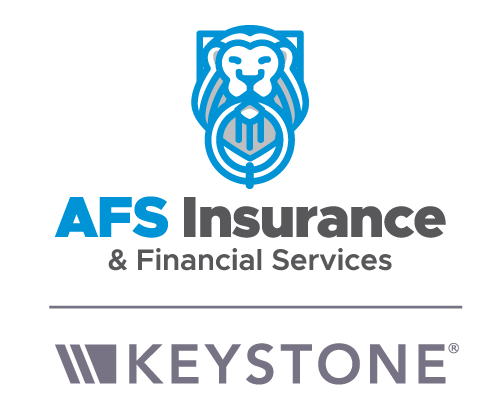 We are backed by one of the nation’s largest independent agency partnerships, Keystone Insurers Group, which gives our clients access to exclusive rates and coverages as well as other benefits. Our Keystone partnership also gives us access to top-level management at the insurance company when advocating for our clients. Convenience. Mobile apps. E-signatures. After-hours service departments. Payments straight to your bank account within hours of reporting a claim. Our clients have the choice to self-service their policies as much or as little as they wish. We utilize technology to give our agents more time to have meaningful interactions with clients either in person or over the phone. At AFS, we focus on getting to know our clients and letting them get to know and like us as individuals. We proudly share our families, hobbies and successes with them through social media, newsletters and welcome packets. As one of our clients, we will help you make smart decisions—protecting you from the unexpected and planning for the predictable.